with my handy, dandy recipe. I’ve moved a bunch in my life. Four elementary schools, one high school (I think I got tired of moving schools), two universities—across four cities. I’m not afraid of change, but it does take me a while to find my footing in a new place and explore. It happened when I lived in Ottawa, in Toronto, and once it happened again for the third time here in Mississauga, I realized that it was a pattern. The pattern starts out with me in a new place. Once I’m there, I don’t really leave my little enclosed space until about 8 months later. I learned that I need time to find my place: to organize my things, feel like its my home… find where I belong, so to speak. Once my roots are planted, then I find the courage, or rather the itch to branch out. I search for a community and my favourite places. In Ottawa, I didn’t really leave my dorm room aside to go to class or to get food with my floormates until about 8 months in. Then I started volunteering for Foot Patrol and I met hundreds of new people and explored the city. Ottawa then became my home, and pieces of me still are scattered across the city, somewhat forgotten until I stumble upon a memory when I visit (which is not so often anymore since I no longer have a partner who lives there). In Toronto, I again only left my apartment to do groceries and to go to class. Luckily I worked at school, so there was only one location for me to go to. Again, about 8 months in, I started to explore Toronto a bit more until I started volunteering for the Toronto Vegetarian Association, where again I met hundreds of people and explored new parts of the city that I learned to love. And now I’m in Mississauga, at the 10 month mark. I feel that itch again, to find community and to meet more people nearby. I wonder where I will go this time, since I’m still volunteering twice a month in Toronto at the Resource Centre at the TVA. I don’t have much free time with work, blogging and YouTube. Even though I don’t really know where I’ll go from here, it’s interesting to discover new patterns in yourself. We’re always growing, changing, learning, and I can only hope that I will continue to be open and welcoming to new discoveries of myself. I’m sure there are plenty of things I don’t know about myself. Quirks, habits, emotional reactions. Knowing yourself and understanding how you act in certain situations can always help you grow and keep calm when everything feels like it’s falling apart. Today’s recipe is also accompanied by a YouTube video. It’s much more light-hearted than this post. Somehow writing these posts always brings out an odd serenity to me that doesn’t really exist in person. I hope you enjoy, and it would mean a lot to me if you went over and subscribed! Like the video and leave a comment every now and then if you feel like brightening up my day. I baked these vegan funfetti donuts as my entry in this years Vegan Bake Off in Toronto, and I’m happy to report back that I won runner up in my category! I lost to a phenomenal vegan mille-feuille cake and it was so good I am not even surprised that it won. I won a bunch of random goodies, like these fantastic smelling coffee beans from Birds & Beans, some coupons and gift cards for YamChops, Earth Balance, Fresh, Magic Oven, some vegan lip balm from Bare English & Co, vegan jelly beans from Dare Candy, vegan peanut butter cups from Go Max Go… and I feel like there were more but I’ve already unpacked and cleaned up my apartment since then so I don’t even know what was once in it. Anyway, it was great to see people’s creativity at work and I’m always inspired when I come home. Check out the video of my 5 hour baking stint where you get to see me get more and more disheveled as the night goes on, and of course all the beautiful treats people baked up for the Toronto Vegetarian Associations Vegan Bake Off! Preheat oven to 350F. Prepare two mini donut pans by greasing liberally with vegan butter. Prepare your two Ener-G eggs in a small bowl and set aside. Whisk in egg replacer and vanilla extract until incorporated. Sift in baking powder, salt, all-purpose flour, and nutmeg and whisk. Add soy milk and whisk until all ingredients are combined. Fold in 1 tbsp of vegan sprinkles. Transfer batter to a piping bag fitted with a large circle tip. (It should be about the same diametre as the radius of your donut cavities. Bake for 15-17 minutes, until the edges are golden and have pulled slightly from the pan. Let cool on a wire rack for 2 minutes, then remove from pan to continue cooling. Wash and grease your pans, then pipe the remaining batter in to bake again for 15-17 minutes. Whisk together vanilla extract, water, and icing sugar until combined. It should be quite thick but still sort of runny. 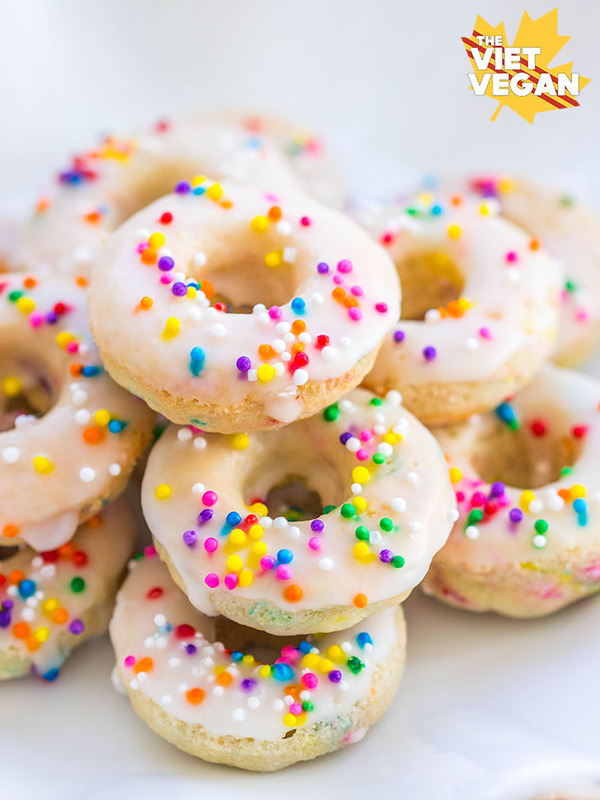 Dip your donuts and add a little sprinkle of funfetti, and let the icing set for about 5 minutes. Question! Do you recommend we use an egg replacer powder specifically or would any egg replacer (i.e. flax/water) do the trick? I've used both flax eggs and Ener-G egg =) I prefer the look of them without the flax, but they both work!